I was in Bali for a total of 31 days and most of those days were spent in Ubud so I am chock full of information about this colorful tiny city. I first heard about Bali from a cousin of mine who told me about how beautiful and serene the tropical jungle is, how everyone was friendly, the richness of the Hindu culture, and 'oh by the way it's extremely inexpensive.' My interest was peaked and by the time I decided to go forward with my yoga teacher training, Bali was the first place that came to mind. Don't be put off by the weird airlines that come up when looking at flights to Bali. You will most likely have to transfer in Jakarta (the capitol of Indonesia of which Bali is a part of) or somewhere in the Middle East or Asia before flying on to Denpasar Airport. I flew to Bali with Garuda Indonesia and it was your regular run of the mill airline. Garuda is with SkyTeam Alliance, the same as Delta, so if you have Delta Skymiles you can use your points or gain points flying with them. I flew back to New York with Qatar Airways, which also flys to Bali and I would highly reccomend them. They are one of the nicer, more posh airlines and are with Oneworld Alliance, the same as American Airlines. My return flight transfered in Doha, Qatar and I had zero problems during my 2 hour layover. 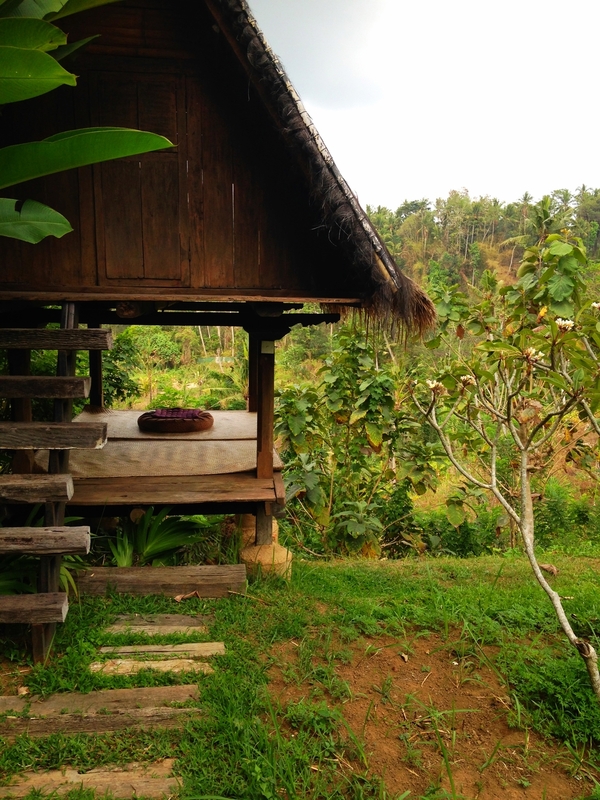 From the airport, arrange for a car to pick you up with whoever you are staying with in Ubud. Car or motorcycle is the only way to get around Bali. Don't fret, the hour and a half long drive to Ubud only costs about $20-$25. I have to recommend AirBnB for this one. There are a TON of awesome places listed in Ubud for extremely cheap prices if you are on a budget. 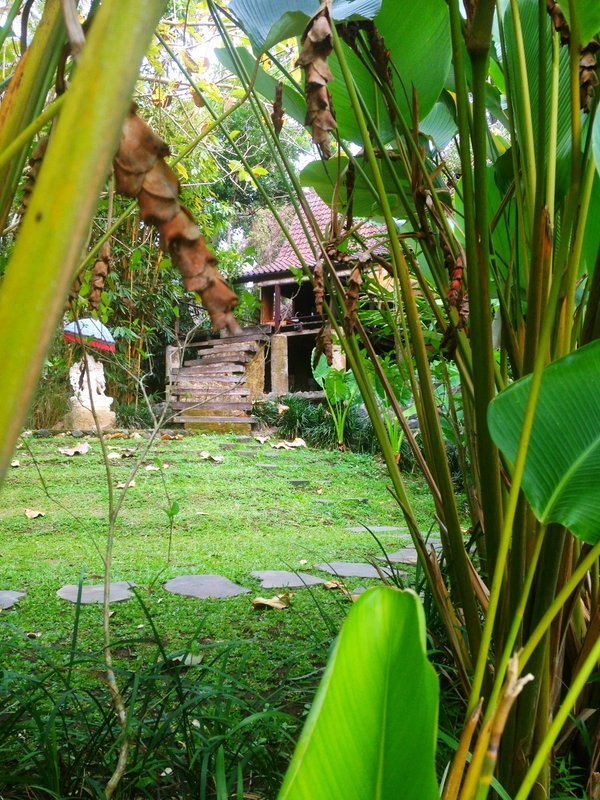 Most of these are guest rooms right in the center of Ubud, and are run by a local family. If you have slightly more to spend you can get an entire private villa in the middle of the jungle for easily less than $100 a night. This is where my boyfriend and I stayed for 10 days before my yoga teacher training began and it was a dream. We took a 10 minute taxi or a scooter ride into Ubud and via taxi the cost was about 50,000IDR or $3.70. If you are not an outdoorsy type of person, you could always go for one of the expensive resorts but I would have to say that Ubud is not for you. You can count on wherever you stay being generally open air and having at least one gecko friend living in your rafters. If this freaks you out, look into Seminyak. Casa Luna - This restaurant is right in the center of Ubud, perfect for a meal after shopping or exploring all that Ubud has to offer. The menu has a little bit of everything, and it's spacious enough for large groups with beautiful balinese decor. Your Airbnb - Honestly wherever you are staying in Ubud will most likely include a free breakfast. Take advantage of this; you won't be disappointed. Most likely they can also order you traditional Balinese take-out for dinner, which is always delicious if you decide to stay in. Earth Cafe - This place is an organic food market as well as a cafe and restaurant. The restaurant is upstairs and has a nice view, and the menu is huge with tons of health elixirs, a middle eastern platter with falafel, and a million vegan and vegetarian options. 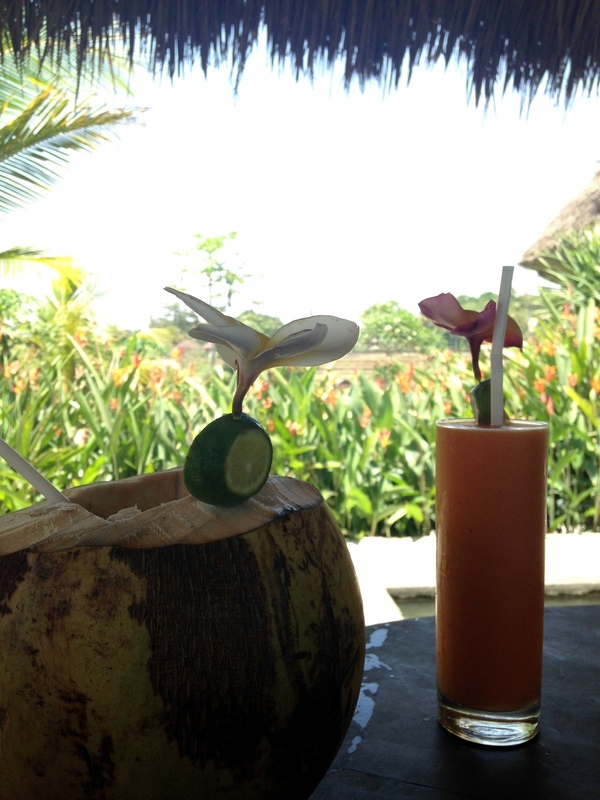 Sari Organik - If you are in Ubud you MUST go to Sari Organik. This place was reccomended to me by a friend and it is truly epic. First thing to know: there are two restaurants in Ubud. Make sure to tell your driver you want the one in the rice fields. He is going to drop you off at the bottom or top of a paved hill that looks like a driveway to nowhere. You have to walk a significant way to get to this place. There is a pathway at the top of the hill thats runs off to the left and then around a corner. There are signs along the way so keep an eye out, but also feel free to explore all the restaurants shops and massage parlors you will come across on this walk through the rice fields. Sari Organik is an open restaurant with an amazing view, serving farm to table, delicious food from their farm right across the pathway. It is truly blissful. Seniman Coffee - This is a popular spot for all the Balinese tourists to come have a coffee and free wifi. They are known for their coffee, which comes a dozen different ways. They also offer tea, juices, snacks and tapas. Perfect for an afternoon rest, or if you work while traveling. Seeds of Life - A vegans dream come true. Everything here is vegan and raw and so. freakin. good. Try their energy balls, and take some to go. Its a smaller space, and expect to sit on cushions around a small table. Clear Cafe - A great place for any time of the day, I came here twice for dinner. Beautiful views from the top floor and colorful decor greet you. They have tables as well as floor seating, a broad menu with dishes from around the world, and great fun juices and smoothies. Bali Buda - One of my favorite places to eat in Ubud. They have a restaurant and a market around the corner. The market is great stocking up on ointments, creams, loaves of fresh bread and vegan energy balls. They sell a little bit of everything, it's like a tiny health food store. The restaurant is conveniently across from Radiantly Alive Yoga, and is great for breakfast, lunch, and dinner. Their fruit bowl is to die for, and their menu is large with mostly Balinese inspired dishes and plenty of vegan and vegetarian options. Go to a yoga class. Ubud is the artistic and spiritual center of Bali so take advantage of the amazing yoga classes offered at Radiantly Alive and Yoga Barn. There are tons of different styles of classes, definitely something for everyone. I took an awesome vinyassa flow at Radiantly Alive taught by Noga Weiss and would highly recommend her class. Get a massage. Or a facial, mani-pedi, waxing, hair treatments, reflexology....Every street in Ubud has five different spas, and did I mention that an hour long treatment usually costs just $8? So go ahead and get a massage every single day. Go shopping. 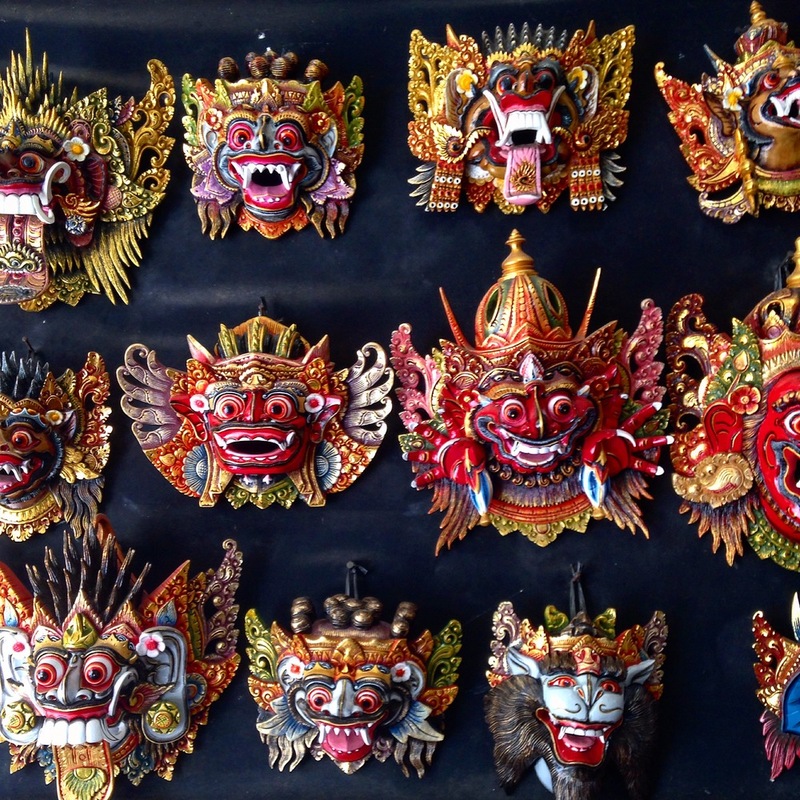 In the center of Ubud be sure to walk down Monkey Forest Road and Hanuman Street. These are the main shopping promenades, and you can find some really beautiful trinkets to bring home. Jewlery is huge as well as artwork, home decor and yoga gear and accecories. Make sure to check the prices, and don't be afraid to barter if you are in the outdoor market. Visit Monkey Forest. I never made it to this section of town, but several of my fellow yogis went and enjoyed themselves. You can walk through the beautiful ancient forest and are sure to see some monkeys up close and personal. Be aware though, these animals are wild and have been known to steal shiny things and bite. See the rice fields. There are several different rice fields you can check out, but the most famous is the Tegallalang Rice Terrace. You can easily fit this into a morning or afternoon and then make plans for the rest of the day. Just ask a cabbie, or have your accomodations call you a car. 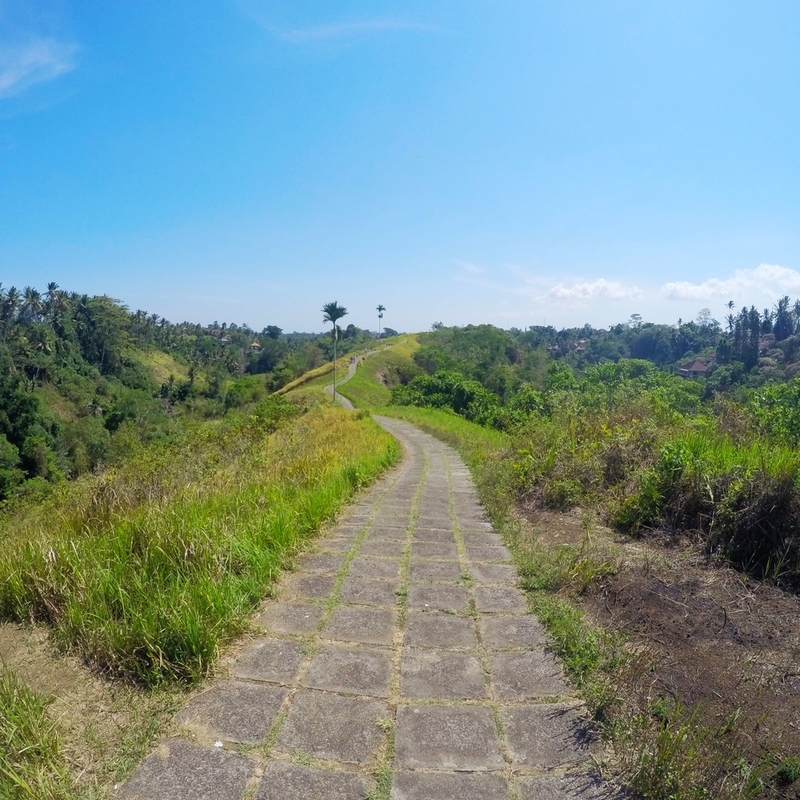 Campuhan Ridge Hike - This is a fairly easy hike along a stone path with some gorgeous views and a lovely cafe waiting for you at the end. The entrance can be a bit tricky to find, I read through this guide before starting out. Make sure you are prepared to sweat; wear a hat and bring water. The pathway ends at Karsa Kafe, a sweet spot with little huts in the middle of a koi fish pond where you can cool off and eat before heading back. There are no traffic rules. I mean no stop signs or traffic lights, if you are passing someone you beep, if you go around a sharp corner you beep, if you are basically doing anything you beep. Mostly everyone drives a scooter or motorcycle and most of the cars are taxis. Bartering is a thing, especially with taxis but don't be a jerk. 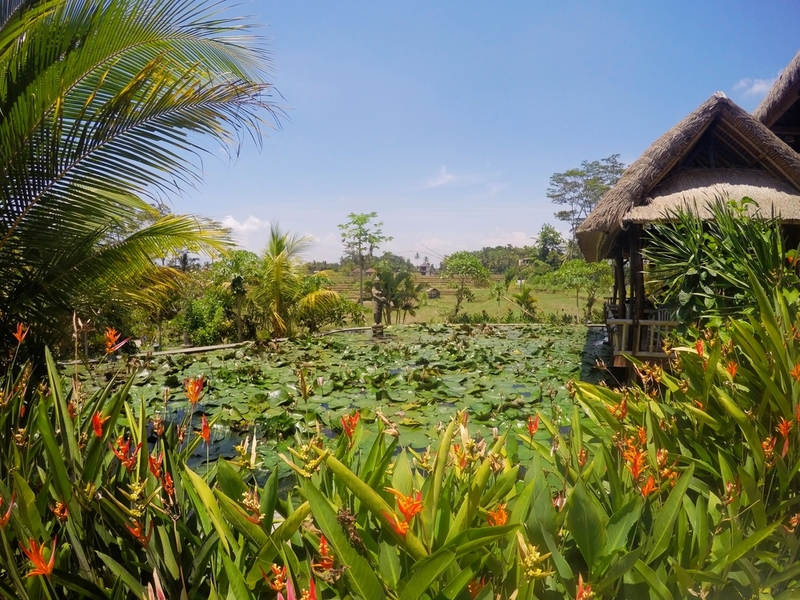 Nothing in Ubud, or Bali for that matter is going to be 'expensive' unless you want it to be. Tipping is not nessacary but is always nice, and the locals will appreciate it. It is Hindu custom to take your shoes off before you enter a building. Don't worry that your shoes will get stolen; they won't. While it's not nessacary for most shops, some do have signs and it's polite. Of course, it's always smart to be aware of the currency exchange. The rate is about 75 cents to 10,000 rupiah. If you are taking out cash, I reccomend using the ATMs inside of the quick markets. Some of the ATM's you will find along the street would not take my visa. Ever been to Bali or Ubud? Planning your trip there now? Tell me about your plans and adventures below!